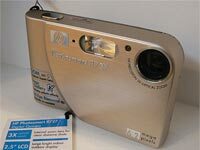 From the monthly archives: "May 2006"
Fujifilm have announced the new Fujifilm FinePix Z3, an ultra compact 5 megapixel digital camera available in blue, silver, and pink. It features a 3x optical zoom lens, a 2.5″ screen, ISO upto 1600, an intelligent flash, a picture stabilisation mode, and dual shot mode (one with flash / one without). LetsGoDigital have published their review of the new 7 megapixel Olympus Mju 700 / Stylus 710, it features a 3x optical zoom lens, a 2.5″ screen, and a weatherproof metal body. It’s available in a variety of colours, and is available for £168 from Amazon.